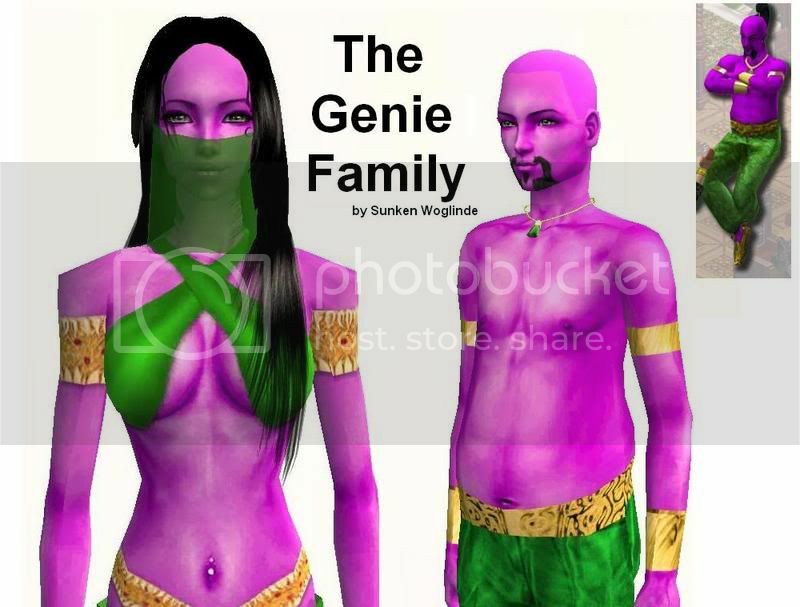 Mod The Sims - The Sims 1 Genie -- And His Beautiful New Family! 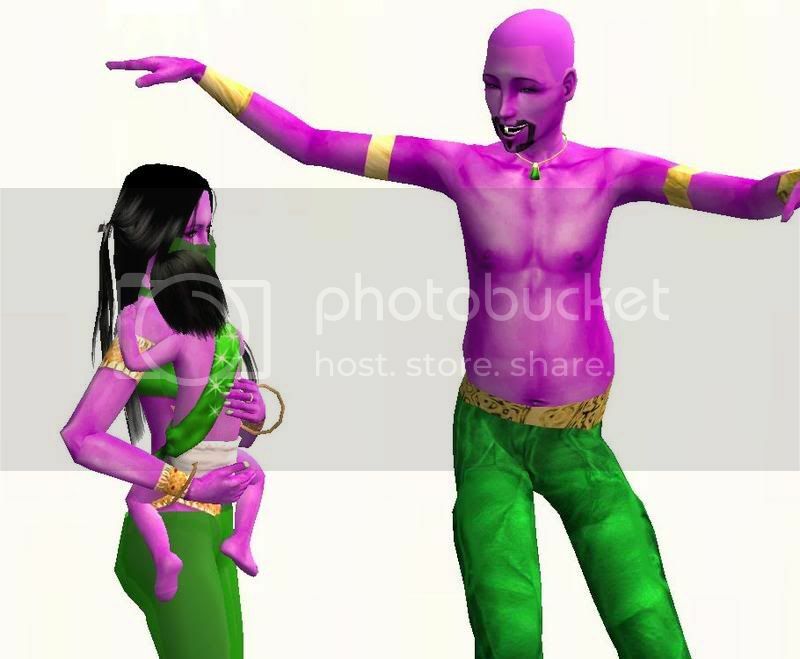 The Sims 1 Genie -- And His Beautiful New Family! So, here you have him-- my version of The Sims1 Genie, in all of his Sims2 glory, with his lovely new spouse and child! As he was preparing to leave the old sim neighborhoods and travel into the unknown worlds of Pleasantview and Strangetown, my old Sim and Mayor, Val Valentine, who had recently had her house set on fire by him once again, noticed he lacked focus. Turns out he was lonely-- and so Val, piting him, wished that he would have a beautiful and loving Soulmate to share his Genie Bottle with him. And thus, Helaena the Genie Woman appeared, and the two got married as soon as they possibly could. Now, our Genie Friend just couldn't be happier-- though he's still stuck in a bottle, setting people's houses on fire and causing relationship troubles by the armfulls, he's at least got someone to comfort him through it, and a new son named Memphis to boot. Now then-- to the technical stuff. I realise that this recreation of the Sims1 Genie isn't perfect-- I couldn't find a proper hairstyle or beard mesh, not to mention he doesn't actually grant wishes-- but I worked very hard on this and am proud of the result. It took awhile to get his clothing, though simple, looking as I wanted it to-- I ended up layering a green leather texture over some Maxis jeans and using the Chrome filter to make him his cool belt. I used an edited metal texture for his top, which is just those arm rings and wristbands. For now, his clothing is only for Everyday-- a Top and a Bottom-- but I plan on converting it to a onepiece for other occasions as well. Helaena(who's name has nothing to do with the Sims2 creator, that than that it's a beautiful name), on the other hands, was much easier for me to create. I had a face sculpt whipped up already, and I just had to recolor some hair and clothing for her. Her hairclip in the screenshots is different from what she is uploaded with; I uploaded her with the same hair, just a different hairclip to match her outfit. The texture of the hairclip is by http://rosesims2.net. And, Little Memphis, who looks great grown-up as well, was most likely the simplest creation of them all. I don't really have anything to say about him, other than that he's a little cutie. "Genie" #7 Skintone Recolor by Sunken Woglinde(http://www.modthesims2.com/member/s...ad.php?t=213639) IMPORTANT: This sim appears with a default light skintone. You'll have to download my Genie Louis recolor if you want the sim to look as it should. 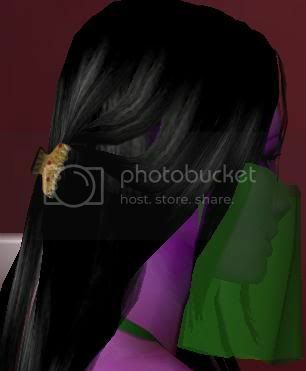 ALSO IMPORTANT: In the screenshots, the Genie is pictured wearing a recolor of PeggySims2's Necklace 14. I need to get permission from Peggy, but if and when I do, I'll upload the necklace in a package file, either here or in a seperate submission. Sorry about that, guys!